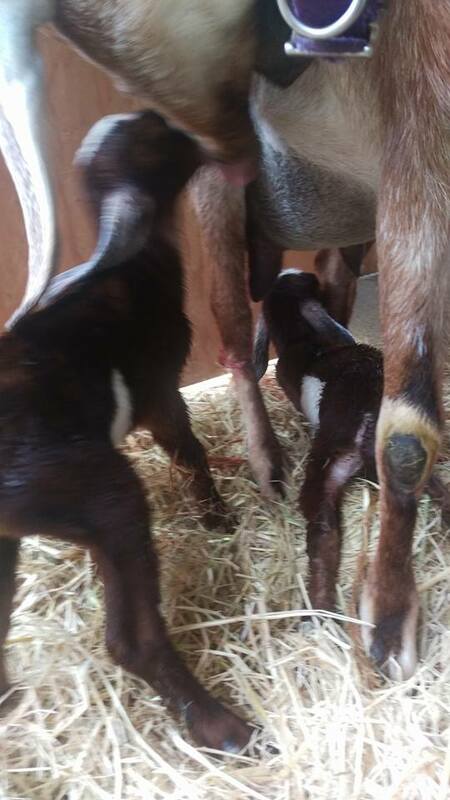 Biggest news first—we have goat babies! 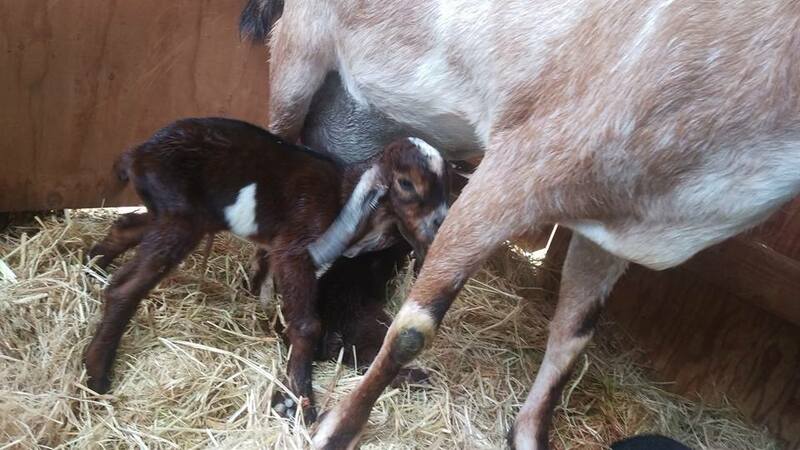 Ella had been moaning and groaning since last Friday and so we’d kept them all in the stall and had been watching and listening to her via goat cam (otherwise known as a video baby monitor), but not much else was going on besides noisy goat-ness. This Friday I woke up after a hard night with Joseph and was told that both Daddy and Isaiah thought she was going to have her babies that day, but Isaiah was upstairs and everyone else was eating breakfast and no one was out with Ella. I couldn’t see or hear her on the monitor, so I pulled on some jeans and a sweater and slipped my bare feet into my shoes for a quick check. As I walked out the other goats were milling about and seemed agitated, but I assumed they were just tired of being in the stall. I saw Ella resting in the shelter and then, as I came closer, I saw something behind her. Then I recognized that it was a baby, completely enclosed in its amniotic sac and not moving as Ella sat there clueless. 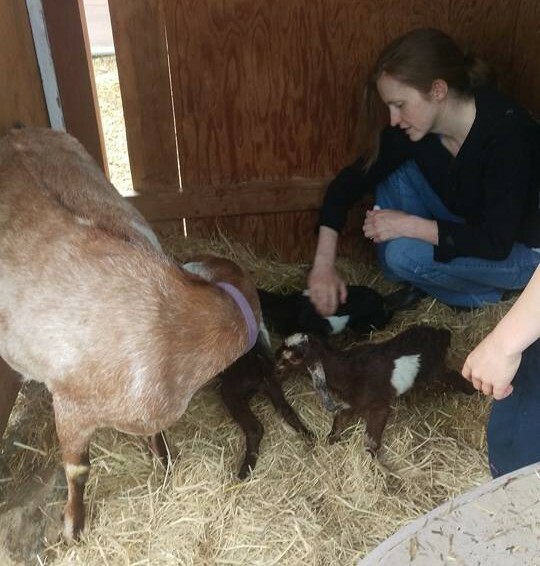 I ran in and yelled to the kids through the monitor to come quickly and to bring the birth kit. I broke open the sac and pulled out a skinny and entirely floppy black and white kid. 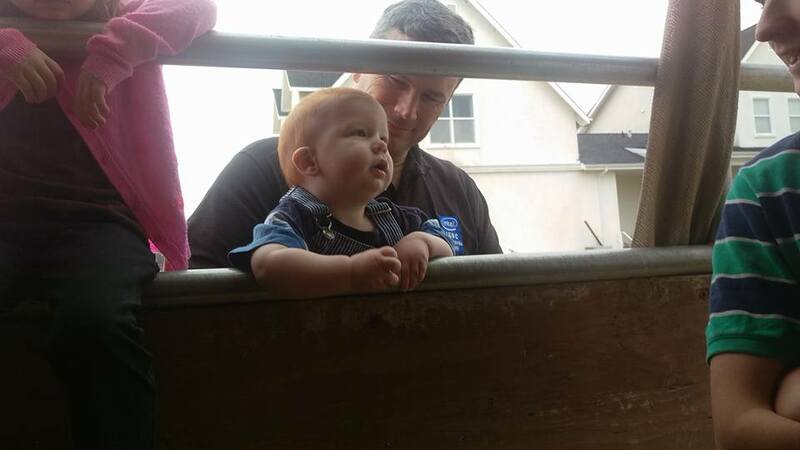 I cleared its mouth and nose off as well as I could, held it upside down by its back legs and then started rubbing its neck and chest and talking to it “c’mon baby, you’re ok baby, breathe baby” again and again and again, praying and rubbing and talking and rubbing and talking. 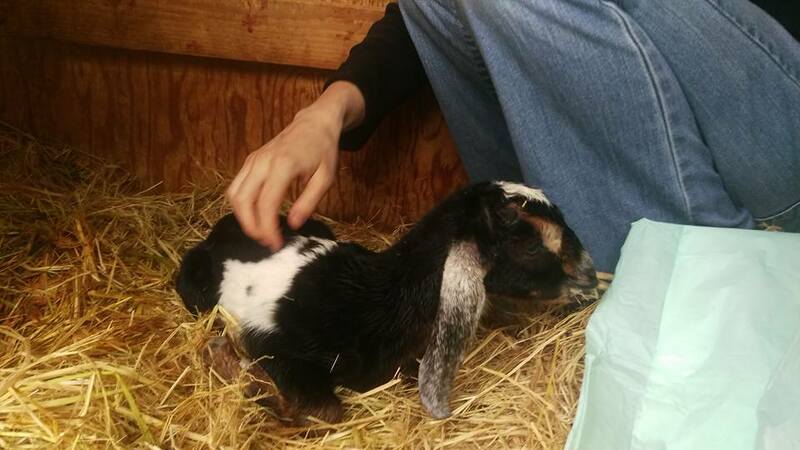 At some point I thought to bring it around to momma goat so she could help out, and she did, licking and licking and I rubbed and talked. I don’t have any idea how long it was, those odd adrenalin-saturated minutes, it may have been a couple of minutes, maybe more like fifteen…eternal…then, maybe a gurgle? maybe a front leg moved? More rubbing and talking, checking its mouth again for missed membrane. Ok, yes, a definite gurgle, a splutter, “good baby, good baby!” another prayer, more rubbing, now baby’s starting to move its head to the side, its eyes are open, good grief my legs are jelly! I laid the baby down and kept rubbing and talking until it was looking sufficiently resilient that I felt I could leave for a moment, then dashed back to the house to call the children (who were still not monitoring the monitor!) and to grab the birth kit. The children came out just as Ella was starting to yawn and strain to birth the next kid. A good-sized bubble appeared and I burst it with a piece of straw (an un-burst bag of waters had been my enemy just a moment before) and immediately regretted it in case the next kid needed the water to be able to reposition, but all was well and the second birth went smoothly—a quick clearing and right over to momma who now had the whole licking thing down pat. Excellent! We checked genders—the first was a girl and the second was a boy. Fantastic! And then she yawned again…Ella only had twins last year and I was looking forward to only having two this year as well. Surprise! Another girl! 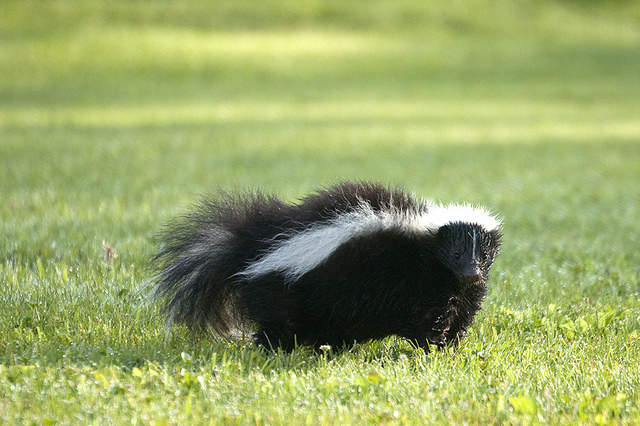 “or a skunk” I said. Everyone laughed. “We could call her Flower.” Everyone liked it. At some point we decided on Blossom for little sister and Elijah offered Bud for the boy. Perfect. 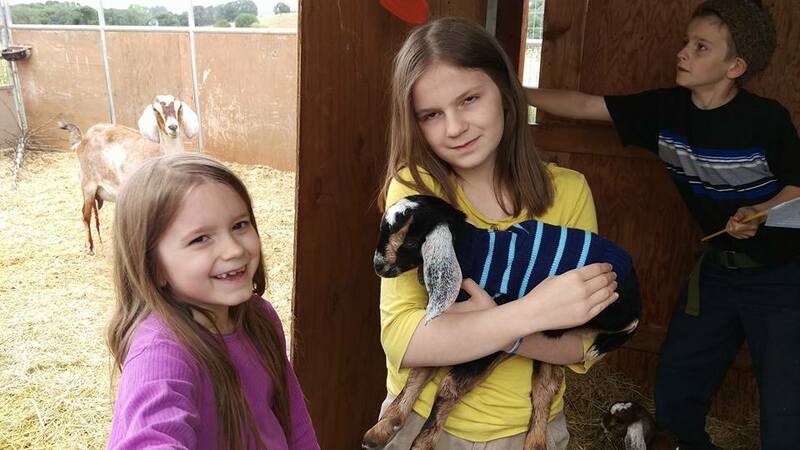 From left to right: Penny waiting to be milked, Jordan growing her new front teeth, Bethel caught mid-blink, Flower in her sweater (she finally stopped shivering) and Isaiah swatting flies double-fisted. 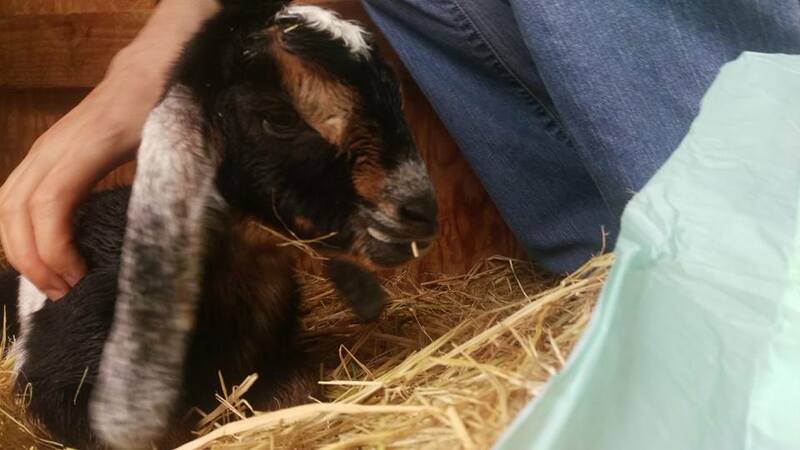 One more goat birth down and two more little girls…do we keep? do we sell? Time to get registered with the ADGA and learn to tattoo ears one way or the other! Not to take too long a babymoon, my husband went out yesterday and bought about 175 lbs of cherries. We gave some away to friends and neighbors who have shared and helped us out, or who we thought might enjoy some cherries, but the kids and I processed close to 30 lbs yesterday and we must tackle the others over the next couple of days. All Saturday’s went into the freezer, but we also need to make some cherry butter/preserves and I think I’m going to try drying some as well. I don’t think that it’s physically possible for us to have so many cherries that we won’t blow through them well before next May arrives. Other kitchen projects include a batch of Kimchi bubbling away in a very lively fashion in the cupboard and a batch of sauerkraut as well. The last batch of sauerkraut was awful…I didn’t monitor the brine well and, although the heremes jar prevented mold from forming, it didn’t prevent the cabbage from drying out and wrecking the batch. I also made rhubarb butter. Note for the future: ½ cup sugar+2 Tablespoons of SteviaPlus is too sweet for 1 ½ lbs of rhubarb and overwhelms the distinctive rhubarb tang. I cut the sweet down substantially (it called for 2 ¾ cups of sugar!) but it needs to be still less. Also, I have declared the sourdough starter I stuck in the fridge a month ago, officially dead from neglect. My kitchen has little masking tape reminders all over the cabinets where my ferments live—currently, Kimchi, sauerkraut and sourdough. Apparently, I need to put masking tape on my fridge as well when I start another batch hibernating there. I’m teaching a sourdough class at some point in the future and so I’ve got to figure this whole hibernation thing out as, apparently, not everyone eats an entire loaf of bread every day. I know, shocking! Things are going well in the garden. Most of the potatoes came up beautifully, the beets and peas are close to harvest and the squash are coming along. We’ve got something going on with some of the melons. I’ve finally figured out the Mittleider weekly feed, finally, so we’ll try that first. Also, The Intelligent Gardener suggests doing a foliar feed when you suspect a deficiency. In his experience, within a week the foliage will either show improvement (yes, you have a deficiency of that nutrient) or no change (no deficiency or not that nutrient). That will be step two. I also set out most of the sweet potatoes this week. They didn’t fill as much of the bed as I had expected, so we should have room for a bit of corn after all. Also, Isaiah finished the second 18” bed, so I’ve got to buy and plant a bunch more tomatoes. It will be nice to have the beds done and to be able to start our own seeds next year. And the chicks arrive by Friday! Ack! Lately, there are a couple of scriptures that I rehearse in my head as I go about my days. The first is not to be weary in well-doing. I think of this on bleary mornings and energy-crash evenings when I really don’t want to be reading picture books, or preparing another meal, or sorting socks for the billionth time, or re-training kids on chores again, or working through potty-training issues, or cleaning banana out of Joseph’s ears and eyebrows. This is my work and I need to do it as well and energetically as I can. Also, I think that the Savior’s direction to forgive even seventy times seven applies extremely well to parenting. It reminds me to keep from labeling a child who struggles repeatedly with certain mistakes, to be soft on these young, developing characters. Tags: goats, grace, gratitude, prayer, records, the barnyard, the garden, the kitchen | Permalink.